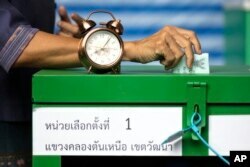 An electoral member shows a ballot during the vote counting, during the general election in Bangkok, Thailand, March 24, 2019. Reporters wait for the general election results in Bangkok, Thailand, March 24, 2019. A woman casts her vote at a polling station in Bangkok, Thailand, March 24, 2019, during Thailand's first general election since the military seized power in a 2014 coup.